Have you started thinking about DOMOTEX 2010? It's coming right up. More specifically, from January 16 through 19, 2010 in Hannover, Germany. In case you haven't - or are just getting started - here are highlights from DOMOTEX 2009 captured in an interview I participated in with Floor Daily's Kemp Harr. 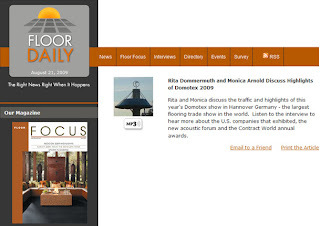 From the Hannover fairgrounds where Domotex takes place, Kemp interviewed Rita Dommermuth and Monika Arnold, both with DOMOTEX, asking them to discuss the 2009 show. Here is how he describes the interview: "Rita and Monika discuss the traffic and highlights of this year's DOMOTEX show in Hannover Germany - the largest flooring trade show in the world. Listen to the interview to hear more about the U.S. companies that exhibited, the new acoustic forum and the Contract World annual awards." Hannover is located in the northern part of Germany, and Domotex takes place in the southern part of the city of Hannover, occupying 13 halls of the 27 halls on the Deutsche Messe fairgrounds. Domotex is the largest floor covering trade show in the world traditionally attracting approximately 1,400 exhibitors and 45,000 visitors. The exact numbers vary from year to year, but attendance has gone up steadily over the last years. Products presented at the show range from high end rugs and carpets, to broadloom, vinyl, new flooring products as well as handmade products from all over the world.Despite the economy, Domotex has seen an increase in exhibitors over 2008, and 45 exhibitors from the US, including 14 new companies in 2009, and all have expressed satisfaction with the quality of interactions. Monika is the project manager for several product categories within Domotex, including contractworld, the new World of Acoustics Forum and contractworld.awards, which well known architects and design community members from around the world actively participate in. For the 2009 program, contractworld.awards received 570 entries from 36 countries. A jury of well-respected professionals selected 14 winners [see contractworld.com for more info]. Domotex includes many special activities including an international flooring laying competition, new products, and information sessions. For example, Domotex is certified by the US Commerce Department, which offered roundtable discussions and insider trade advice, including one about doing business in Russia. If you attended, do you have other observations to add?